I have been a huge fan of ON's "textile" capabilities. Textile technology, production and machinery has been a long time strength of Switzerland where ON is based. 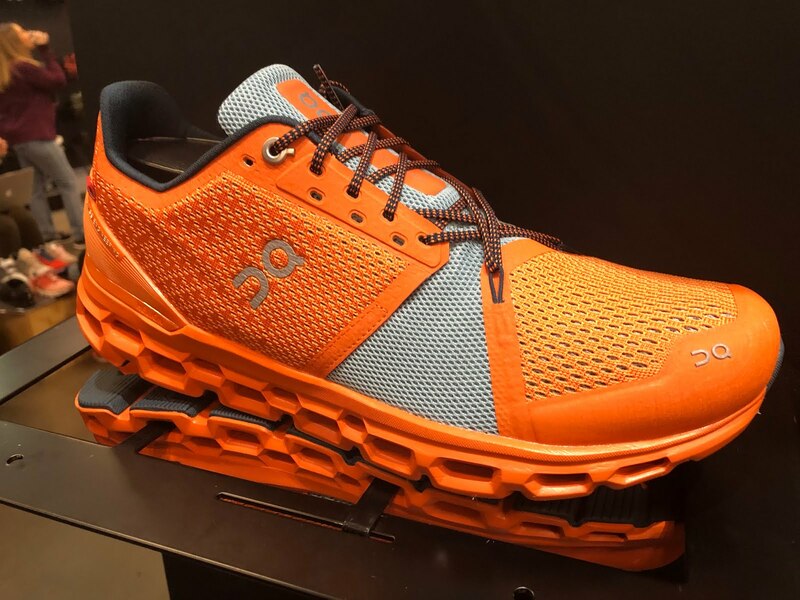 Their run apparel is spectacularly comfortable and functional. I am going on my third winter in their Running Pants and picked up their Lightweight Running Cap and stylish High Socks, featuring them in our 2018 Gift Guide here. Their shoe upper designs are modern and beautifully executed shoe after shoe. Swiss Engineered ON run shoes with their distinct channel through CloudTec elements and stabilizing and propulsion Speedboard have not, beyond the light and fast Cloud and Cloud X, really been to my liking over the years. With firm heels they are often stiff with the run feel kind of dull I struggled to enjoy them. I have not run the more flexible Cloudflow though. 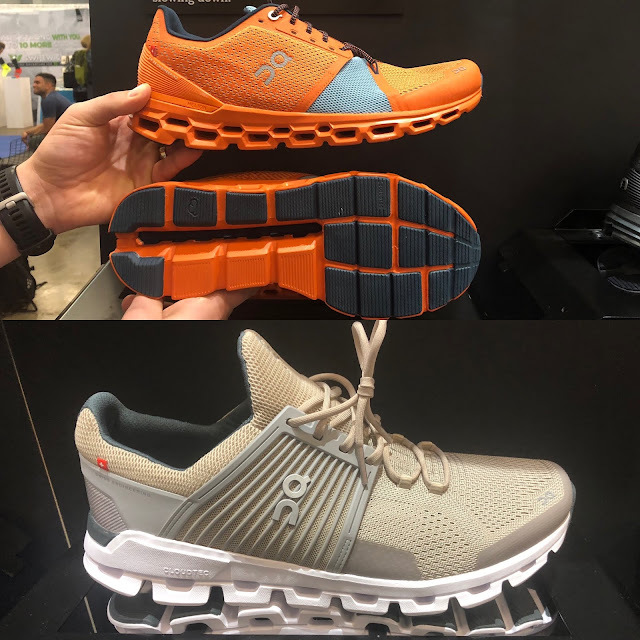 Well for 2019 ON has my attention with two new shoes: The Cloudswift, a daily faster trainer with a new midsole foam and the Cloudstratus, a heavier duty trainer with dual heel layers of CloudTec elements focused on maximum cushion and a stable ride. Cloudswift features a new"super foam" called Helion which is said to be lighter, softer, and more agile than ON's previous foams. 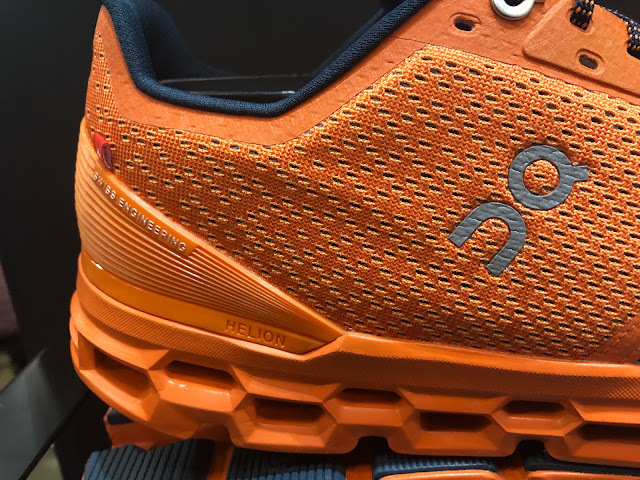 The Helion foam is said to be more consistent across temperatures which makes me wonder if there is TPU in the mix which can give midsoles bounce and energy "return".The shoe sure felt more flexible than most prior more cushioned ON. The upper features a silicone cage which felt soft and foot compliant and is not the usual more rigid TPU based cages we often see. The Cloudswift comes in at 10.2 oz (US men's 8.5), 8.5 oz / 240 g (US women's 7) and has a 7mm drop. Available February 2019. 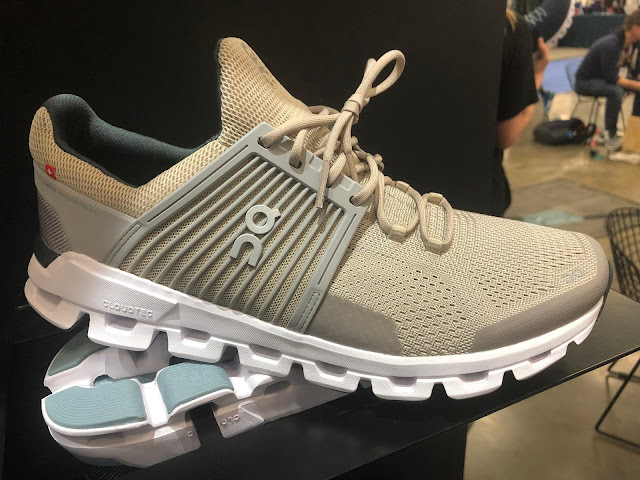 The spectacular looking Cloudstratus addresses that firm ON heel with a dual Cloudtec Elements rear cushioning system. It should be a plushly cushioned heavier duty trainer with some stability in the mix. The cushioning is sequential in that as the foot compresses a lower element and moves forward residual forces are absorbed by the upper elements while also helping propel you forward. I pressed the midsole and could clearly see this working as compressing a lower element with force and forward made the upper element compressand flex in sequence. 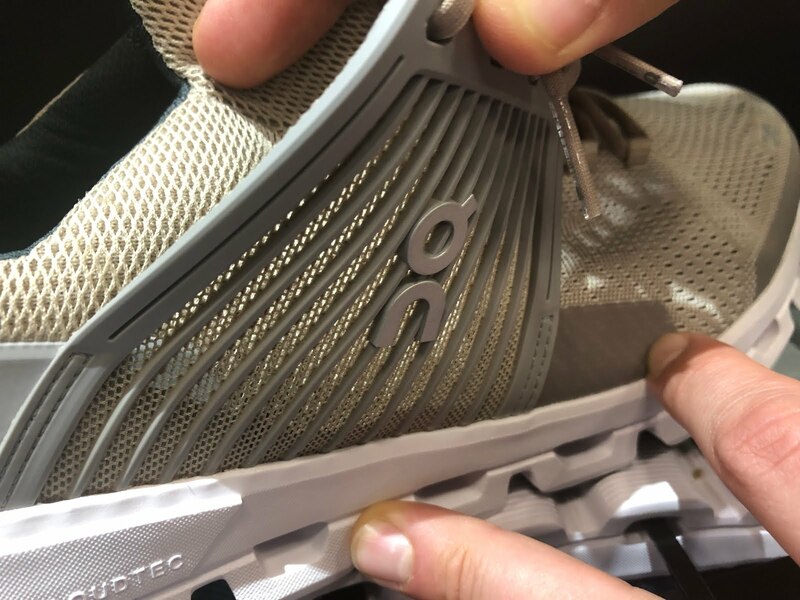 At the forefoot, we have a single layer of Cloudtec elements with a fuller coverage outsole for a more stable and powerful toe off. The beautiful upper is designed to flex with the foot with the forward asymmetrical star shaped lacing drawing the foot back to control the forefoot while not getting any overlays at the end of lace up in the way of flex and bunions... The lacing can be customized by doubling up on the eyelets. As always there is some serious Swiss engineering in this upper. 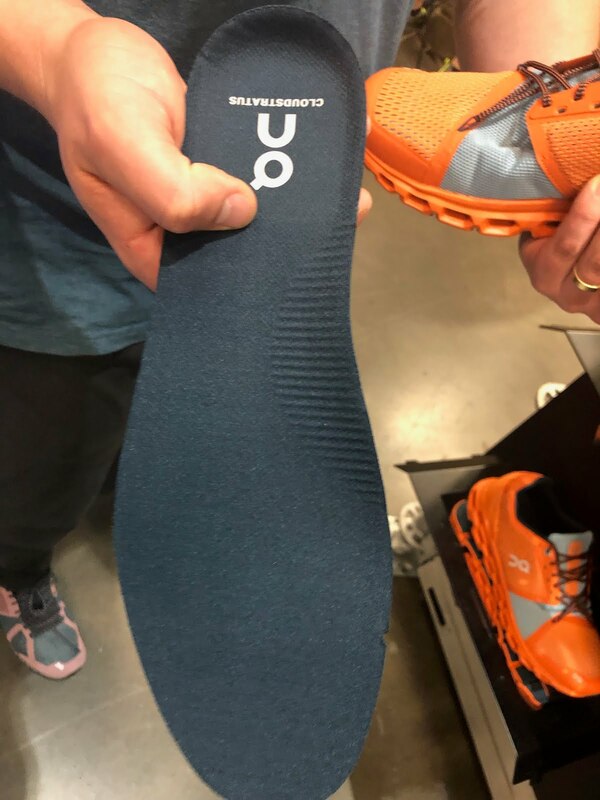 The sock liner is ribbed under the medial arch to provide some proprioceptive sensory feedback to "subconciously stabilize your foot strike." Clever, doesn't add weight and worth a try! The Cloudstratus comes in at 10.75 oz / 305 g (US men's 8.5) with the women's US 7 at 9.5 oz / 270 g and has an 8mm drop. Available June 2019. 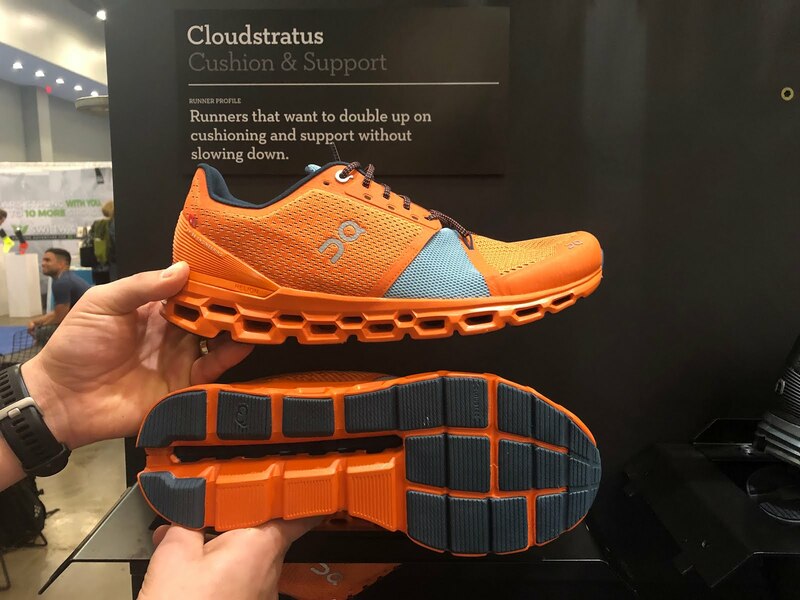 Any chance you guys will do a review on the new Cloudventures? 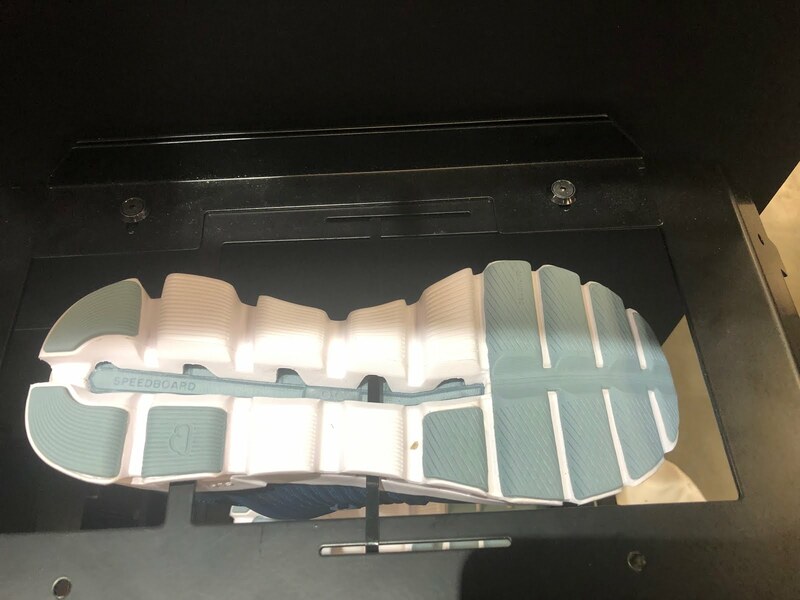 To confirm: Helion is a TPU midsole foam. To be accurate, Helion is OBD polymer. To accurately confirm, Helion is a type of On foam.